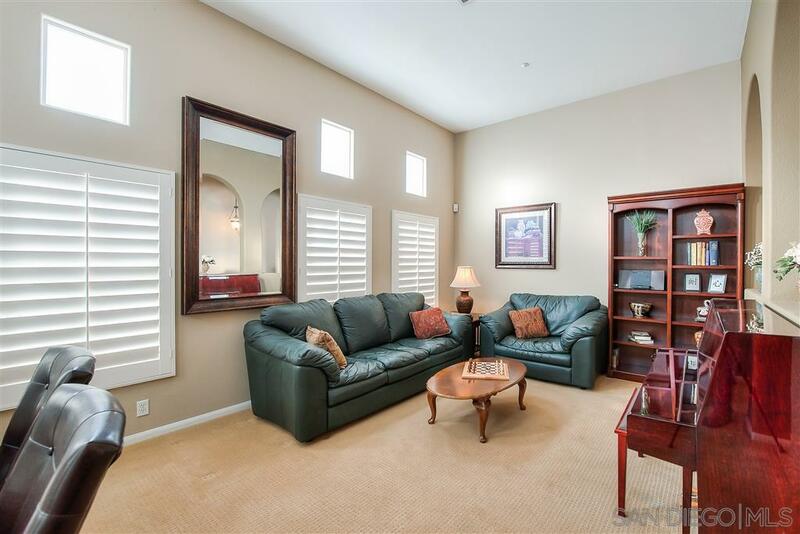 Wonderful townhome in desirable Bellarado community in Torrey Highlands! This is the largest floorplan featuring 3 bd plus an extra room/den. Spacious end unit with vaulted ceilings in living room/dining rm & lots of windows for natural light. Many upgrades to enjoy including plantation shutters, granite counters, ceiling fans, as well as a large patio, & a balcony off the family room. Conveniently located near shopping,dining, the new park & freeway access. Walking distance to Westview High School., This lovely home features a bright expansive floorplan, accented with vaulted ceilings, plantation shutters and ceiling fans. Entertain in the formal living room with a dining area or relax in the family room with cozy fireplace and adjacent balcony. The open kitchen features rich cabinetry, granite counters and a center island with a breakfast bar. Spacious carpeted bedrooms in addition to a bonus room/den, are all located upstairs. The large master suite has separate soaking tub and shower, & dual vanities. You'll appreciate the large patio which offers space to entertain, BBQ and enjoy outdoor dining. The attached 2 car garage features a convenient large storage area. "Special financing incentives available on this property from SIRVA Mortgage"